Although JMeter is mostly used for web application load testing, it has immense capability to deal with databases. In this post, we will explore JMeter’s ability to carry out load testing of MySQL database. We will also explore load testing of other databases in later posts. But for now, make sure you have an access to MySQL database to implement a simple JMeter MySQL load testing example. JMeter uses JDBC Connection Configuration element where we can define database configurations. 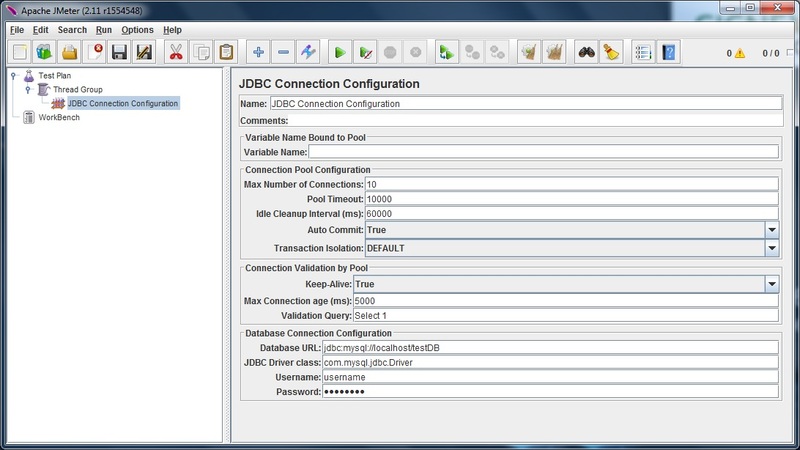 Armed with the details provided in JDBC Connection Configuration element, JMeter can send JDBC request to database using JDBC Request sampler. We will see JMeter MySQL connection in works using simple example explained below. Follow these steps. JDBC driver is needed in JMeter for connection with MySQL database. You can download MySQL JDBC driver from here. Copy the driver JAR file in JMeter installation’s lib folder. Restart JMeter if it is already open. Add JDBC Connection Configuration element under thread group. In this element, you will need to provide database details. Enter database URL, JDBC driver class along with database authentication details as per below image in ‘Database Connection Configuration’ section. You can keep other other details as it is for now. Add JDBC Request sampler under thread group. Select your query type from the drop down box and enter SQL query. Finally, add a View Result Tree listener under thread group to check the results. Bonus tip: You can theoretically carry out load testing of multiple databases using the Variable Name field in JDBC Connection Configuration element. All you have to do is, define a variable name in the element and reference it in JDBC Request sampler. The sampler will use JDBC configuration of element from which it is referencing the variable. As you can see, configuration of JMeter for load testing of MySQL is relatively straight forward. How did you like our JMeter MySQL load testing tutorial? We would like to hear from you in comments. Thanks for the wonderful intro guide. In my turn I would recommend to check out on how to deal with transactions in JMeter’s JDBC-enabled components. See JDBC Request Transaction Isolation article for details.